Born: 31 May 1859, France. Died: 22 June 1945, La Force, Dordogne, France. 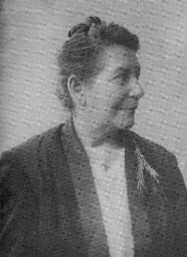 Anna Busch was educated in Paris, joined the Societe des Mission Evangeliques de Paris, and in November 1877 accompanied the Rev. E. Ellenberger and his wife to Basutoland (now Lesotho) where she was a teaching assistant in the Normal School for girls at Thaba-Bosiu. She married the missionary and Southern Sotho linguist Hermann Dieterlen (1850-1933) in 1878 and assisted him in his work as head of the Hermon mission. They moved to Morija in May 1887, to Leribe in January 1895, and to the Botsabelo Leper Settlement at Likhoele in 1913. The following year Hermann resigned his post, but they remained at Likhoele. In 1919, with the reunion of France and Alsace after World War I, they settled at Strassbourg. Anna remained there after her husband's death, untill the outbreak of World War II in 1939 compelled her to move to La Force, where she died. At Leribe Anna develolped an interest in the local flora and started an herbarium. She collected mainly on the Leribe plateau near the Free State border, at an altitude of 1500 to 1800 m, though also in the lowlands, while her husband added some specimens from further inland. Her plants were identified by the South African Museum in Cape Town, and by Professor C. Flahaut at Montpellier university. In total there were 1380 numbers, but as she often gave the same number to plants of the same species collected at different times or localities, her specimens probably exceeded 2000. Though most of her specimens were excellent, a collection from her received by the South African Museum in 1906 arrived in poor condition. None the less the collection was worked up, and in 1908 she sent a further 150 specimens, with more following in 1909, 1911 and 1912. Her knowledge of Sesotho enabled her to obtain the vernacular names of her specimens, as well as information about their ritual, medicinal and economic uses. Thus by 1911 she had contributed some 650 plant names and other words to the fourth edition of A. Mabile's Sesuto-English dictionary, which was revised, expanded and edited by her husband. In 1913 E.P. Phillips* visited the Leribe plateau and four years later published "A contribution to the flora of the Leribe plateau and environs...", based largely on Dieterlen's collections, in the Annals of the South African Museum (Vol. 16 (1), pp. 1-379). On leaving Lesotho in 1919, Dieterlen presented her entire Lesotho collection to the Government Herbarium in Pretoria. As she collected many duplicates, her specimens can also be found at the South African Museum, Maseru (Lesotho), Strasbourg, Paris, Kew Gardens, and elsewhere. Several species were named in her honour, including Euryops annae and Lotononis dieterleniae by Phillips. Both Anna and her husband were elected corresponding members of the Philosophical Society of the Orange River Colony in 1907. Cape of Good Hope. Report of the trustees of the South African Museum, 1906-1909. Dictionary of South African biography, Vol. 1, 1968 (Hermann Dieterlen). Jacot Guillarmod, A. Botanical exploration in Basutoland. South African Journal of Science, 1967, Vol. 63(3), pp. 81-83. Phillips, E.P. A brief historical sketch of the development of botanical science in South Africa and the contribution of South Africa to botany. South African Journal of Science, 1930, Vol. 27, pp. 39-80. Union of South Africa. Report of the South African Museum, 1910-1912.